Kubota gear is solid, well engineered, and well made. What you see is what you get with this brand. It never disappoints with sloppy assembly or inadequate performance. It’s not the fastest utility vehicle in the shed, true, but the people who buy it are notorious sticklers for reliability, value for money, and care nothing for top speed. 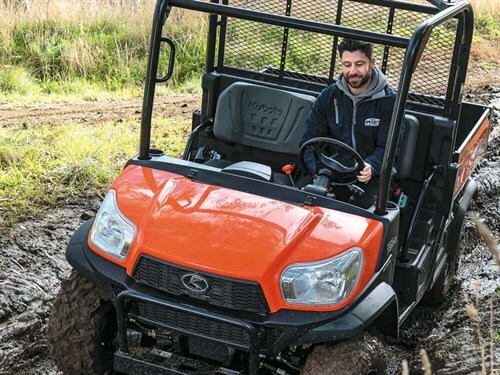 The medium end of the utility market, where this Kubota lives, is dominated by the Polaris Ranger diesel and various John Deere Gator models. The Kubota is made in Georgia (US) and comes in three variants. The base model we’re testing here is known as the ‘general purpose’ model with ATV tyres and a manual cargo bed. Above it are two ‘premium’ models, the X900W-H with work-site tyres and a hydraulic cargo bed, and the X900W-A, with ATV tyres and the same tilting cargo bed. You can think of the X900 as an entry-level model if that helps you place it in the overall scheme of things. Historically, buyers are farmers, councils, light-industrial operators and airport managers who must move weird objects between all those Boeings and Airbuses. The X900 general purpose is well priced compared to some of the lesser models that can’t match its engineering and longevity. You get what you pay for in this business and Kubota offers a lot for the money. A hydrostatic transmission and hydrostatic power steering, for example, along with a highly rigid steel frame, under-seat storage, independent suspension front and rear, and heavy-duty skid plates. The cab has a ROPS as you’d expect. Steel bolsters help prevent driver or passenger exiting the vehicle involuntarily, though we don’t really like steel bars for this purpose. One of our testers needed shoulder surgery after rolling a bike recently and having his shoulder come into violent contact the bolster. There must be a better way of achieving this safety objective, and one day, a utility manufacturer will find it. Controls are sensibly laid out and easy to use. There’s no P in the gearbox but a ratchet-type handbrake. The shift pattern is what manufacturers like to call ‘linear’: L-H-N-R, with no P to complicate things. The shift action was very notchy on our test vehicle but the thing was brand new and that’s a good excuse. As most people know, you can expect the shift action to free up after several hundred kilometres. The digital instrument pack is centred in the dash and easy to read. To start the machine you make sure it’s in neutral and then turn the key. Visibility towards the front is good; important when you’re scrambling over rough terrain and need accurate wheel placement. 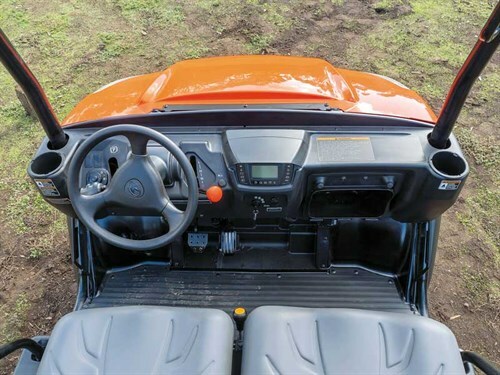 As always, my first impression climbing into a Kubota was that the vehicle feels compact and that you sit high where you can see everything. The passenger grab-bar is set into the vertical ROPS pillar in front of him, but to me, this was a stretch to reach and spoilt an otherwise comfortable seating position. You could always hang on to the shoulder bolster I suppose, though that comes a bit too close to having an arm outside the vehicle, or they could fit another grab-bar in the ROPS above your head. On the other hand, I might be the only dope to mention this so everything I’ve just said about that grab-bar, as Mel Brooks once observed, is "authentic frontier gibberish". Having a hydrostatic transmission on a small vehicle like this may seem like overkill but it’s not. 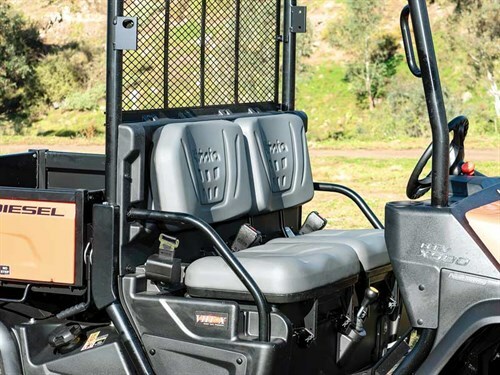 With high and low range, a limited-slip front diff and a foot-operated lock on the rear diff, the only obstacle to make an X900 flinch is a hill requiring more than the 21.6hp (16kW) its three-cylinder diesel produces. Meagre horsepower is its only limiting factor, more so when the vehicle is laden to capacity with two blokes up front and a steel tray full of heavy gear. Suspension front and rear is by dual A-arms. Adjusting ride height is done by changing preload settings on the shocks, though how many users would actually do this we have no idea. 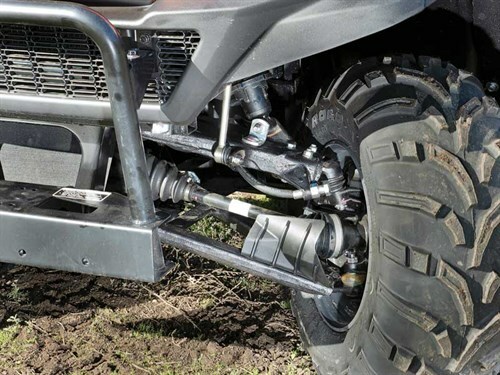 Each manufacturer claims his independent set-up is superior, but in truth, not much has changed in the world of UTV suspension since what’s-his-name invented the coil spring. All UTVs ride well. On the other hand, they’re not all as quiet as this one. But steering has changed, particularly with the advent of power assistance. 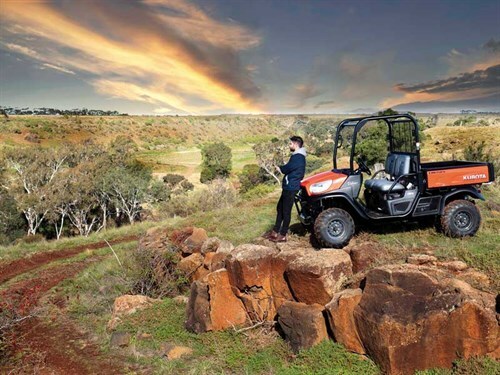 Watch our video and you’ll see Kubota Mick steering with one finger as the X900 traverses a boulder field. The benefit of hydrostatic power steering is the total lack of kickback, and though we wouldn’t recommend driving everywhere with only one finger on the steerer, Mick’s way of proving his point was convincing. Power steering and a reasonable turning circle (four metres) help make the X900 manoeuvrable in tight situations. That’s handy. It also makes this model easy for anyone to drive. The engine is well muffled, the transmission quiet, and daily maintenance checks straightforward. The fuel tank sits in the chassis on the driver’s side. Lifting the bonnet gives access to the radiator, the coolant bottle, the brake fluid reservoir, and the two-stage air filter, the latter contained in a clip-canister on the right-hand side. There’s a decent-size glovebox and plenty of under-seat storage for items you’d like to keep dry. And with that, we’d like to make the point that Kubota’s transmission breather doesn’t like you punting the X900 through water deeper than half-wheel height. I was gently reprimanded for doing that on another Kubota test, though I have to say nothing happened that day to suggest that the breather was too low. Kubota doesn’t recommend it, though, so don’t do it. 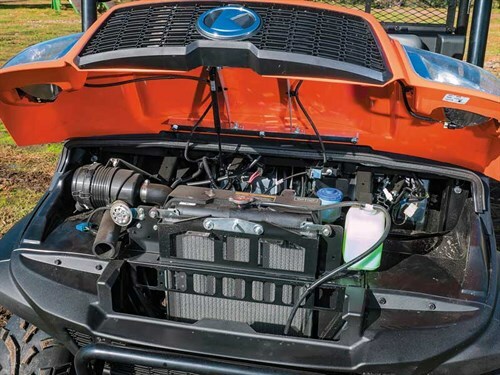 Not every Japanese manufacturer makes a diesel-powered UTV and not all these factories persist with the notion that UTVs are workhorses, not playthings. Yamaha stuck with that idea for a long time with the Rhino but had obviously changed its tune by the time it released the more sporty Viking, then the five-speed, paddle-shifting YXZ1000R. But Kubota persists with the original idea. 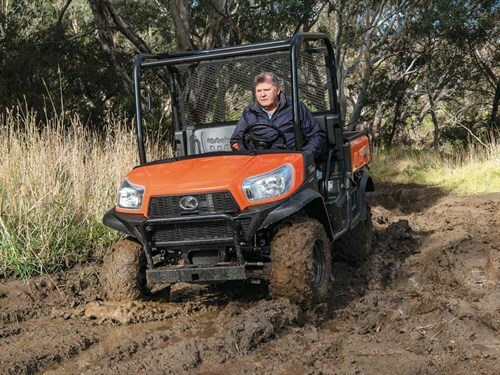 There’s no ‘sporty’ Kubota; apart from the petrol-driven RTV400Ci and the RTV500G-HD, they’re all diesel and all workhorses with no intention of being racehorses. The X900 is popular because it gives buyers good engineering at a nice price, and that’s always hard to beat. It’s also easy and pleasant to drive and that will win friends among those with little experience in small cross-country vehicles.